The Little Mates series of books have a book for each letter of the alphabet. 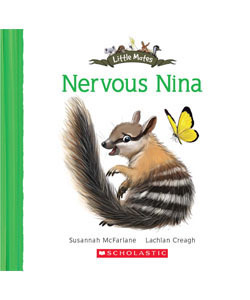 Nervous Nina of course is the book for the letter N and is filled to the brim with nifty N words. Nina is a bit to nervous and anxious to get involved with activities and play with her friends. Nina is a nice but nervous numbat. numbat in all of North Nundroo. Nervous Nina and the series are great for those who are learning their letters and sounds or even those children who are looking to grow their vocabulary with lots of lovely new words. Great for home and school. I plan to collect the whole set. Get your tongue twisted today! See also Kind Katie & Lazy Lou Lou.